The very latest in 4 layer bonded Scooter Cover technology is now available via us in the UK. This fabric is unique, and is a result of years of research and development to produce a fully waterproof cover that is also breathable. These covers utilise high-tech manufacturing techniques to ensure the maximum protection of your bike through years of service. Welded seams are used wherever possible and double stitched hems ensure long life and total outdoor protection. They are suitable for year round use in all weather conditions and are incredibly strong. In very low temperatures, the fabric remains pliable and in strong, hot sunshine they keep interiors cool and protect from top / interior fade, paint damage and other sunshine degeneration. CoverYourBike Stormforce scooter are possibly the best covers available to buy in the UK today. 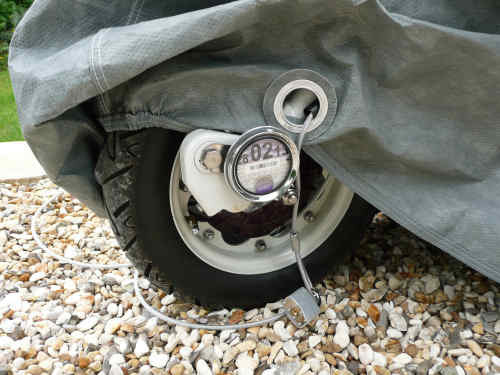 Simply Select your Vespa Scooter model below as well as any options you may have and we will supply the correct fitting cover, Simple and Easy. We have separate fitted patterns which we supply if you bike has a top box fitted. Upgrade to Stormforce PLUS for a total 360 degree hemline tension skirt, custom fitted by our factory, ensuring the cover stays on the bike, even in the worst weather. This skirt also adds an extra 3 inches to the depth of the cover, giving ultimate coverage and protection. 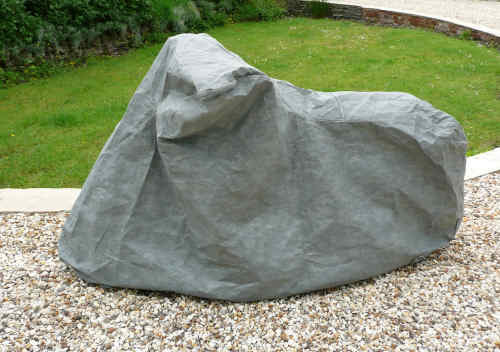 BMW Motorcycles STORMFORCE 4 Layer Outdoor Waterproof Cover.